I’m fortunate to live near the J.Crew distribution center. Almost monthly, they have a warehouse sale and on occasion (maybe once a year?) 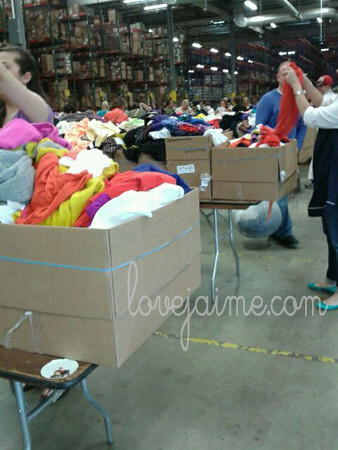 they have a HUGE warehouse sale. Like, stand in line for hours before they open, kind of sale. This past weekend was one of those sales and I just happened to swing by it after I picked up my race packet. I snapped a couple of photos of the discarded umbrellas outside the warehouse, and then when I walked into the warehouse. The place is insane. As you walk in, you’re handed a price sheet (nothing is labeled with prices. There are prices for pants, shirts, coats, etc. and it’s just one set price.) You could spend hours and hours digging through boxes looking for clothes that might fit you. I, however, did not have hours to dig. I had about an hour to get in and out of there. Total, I spent $100. That included 4 bathing suit “pieces”, two pairs of pants and a coat. Considering I haven’t had a big clothing purchase (for me) recently, I’m extremely pleased with this trip. Are you a big clothing spender? What stores have you found great deals at recently?